It was touch and go for Molly after being hit by a car. 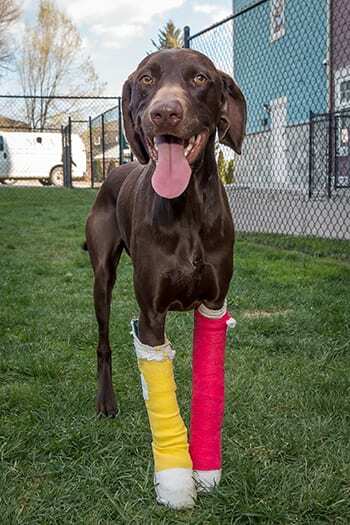 The three-year-old chocolate German short-haired pointer nearly didn’t make it, due to the extent of the injuries to both of her front legs, but thanks to the Kelowna SPCA, the veterinary team at Tri Lake Animal Hospital and Okanagan Veterinary Hospital, the lovable pup will have a new chance at a long and happy life. Molly suffered from a broken left ulna bone below the elbow in her left leg and a dislocated wrist in her right leg, requiring a surgical repair plate to be screwed into place to stabilise the break in her left leg, with her right wrist fused to repair damage to the wrist joint. Both legs will be splinted in casts for several weeks, after which, rehabilitation will help get her back on the road to recovery. The surgeries and all related medical care costs are not inexpensive, Pugh says, noting Molly’s care is expected to be more than $7,000. A non-profit organization, the BC SPCA relies primarily on public donations to help the province’s most vulnerable animals. “Molly is such an absolute sweetheart! She really deserves the chance to heal and we’re committed to helping her on her road to recovery,” Pugh says. If you can help Molly or other animals like her in need at the Kelowna SPCA, you can donate online at spca.bc.ca/medicalemergency or in person, at 3785 Casorso Rd., Kelowna.